The end of a lawsuit this month might also signal the end of youth football. The plaintiff in the suit, Debra Pyke, claimed that her son suffered brain damage from repeated head injuries in his youth football league, which caused chronic traumatic encephelopathy, or CTE. Just a couple of weeks ago, the youth football league Pop Warner settled the $5 million case, reportedly for under $2 million. The lawsuit includes multiple arguments about why children are more vulnerable to head injuries. Their brains are still developing, and have less myelin to protect their brain cells from damage. Until the age of 14, children's are disproportionately large, and their necks are weaker than adults’ necks, making them prone to greater rotational forces when hit in the head. The “unlikely event” didn’t happen, but only because the league settled the suit. Using words such as “unclear” and “uncertain” seems to me to be a classic example of sow confusion rather than admitting the obvious: youth football can be dangerous. Consider the “pee wee” league game in 2012 where five boys got concussions in a single game. The coaches were suspended afterwards, but the damage had already been done. At the time, the NY Times pointed out that “Pop Warner has done more than perhaps any other organization to try to protect young players from head injuries,” but the fact is that football is a violent contact sport. 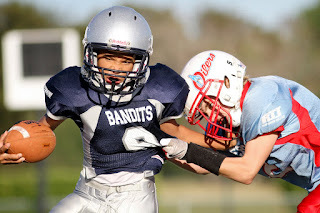 As the New York Post reported when the settlement was announced, Pop Warner had $2 million in liability coverage for players in Wisconsin at the time of the lawsuit, in 2012. They now carry $1 million per player and allow individual chapters to add another $1 million. Think about that for a second. Why would you want your son to play in a youth sports league where the league feels the need to carry a $2 million insurance policy on every player? Parents: you and your kids have other options besides football. Youth sports are a great way for kids to exercise, have fun, make new friends, and learn the value of teamwork. Your kids can choose soccer, tennis, baseball, or basketball, all of which have large networks of youth leagues. Many regions of the country have other sports as well. There’s no reason to suit up a child with a helmet on his still-growing head and send him out on a field to be knocked around and possibly concussed. Joseph Chernach suffered a tragedy, and his family’s suffering will never go away. We’re now learning that even powerfully built grown men suffer permanent injuries on the football field. There’s no reason to expose children or teenagers to similar risks. This week I'm calling out some recent headlines about medical "breakthroughs" that were wildly misleading. Even when the science itself is good, bad reporting raises false hopes and eventually undermines the public's confidence. 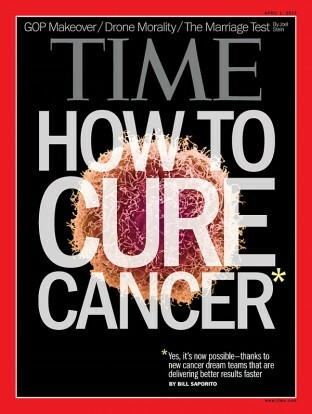 At some point, people will just no longer believe the headlines claiming that someone has once again cured cancer. Wow, I thought. This would be a real breakthrough if it were true. I traced the headline back to the MIT press office, where I then saw the subheading: "turning on a gene later in life can restore typical behavior in mice." Uh oh: extrapolating any treatment from mice to humans is fraught with problems, and studying a complex behavioral disorder like autism is even more difficult. "Reversing autism 'at the flick of a switch': 'Turning on' a single gene in mice has been found to reduce autistic behaviours"
What did the researchers actually do? They studied a gene (see the paper here) that is already known to be associated with autism in humans–though only about 1% of cases–and that has already been shown to affect the behavior of mice as well. They created a means of "fixing" this gene in mice, and showed that it can restore some of the mouse behaviors to normal. My assessment: this is nice incremental work on a gene that seems to affect behavior in both mice and humans. I don't see it leading to any advances in the treatment of human autism for at least a decade, if ever. So where are we on reversing autism? Probably no closer than we were before this report appeared. I give the science a B, but the science news gets an F.
"Breakthrough in cancer research could spawn new treatments"
Sigh. I can't count the number of times I've read that cancer is about to be cured, only to learn that no new treatment exists, and nothing is even close. So what is this new breakthrough? "Researchers discovered that even though cancer cells mutate wildly within a person's body, the cancer cells within each patient also have common mutations–ones that could be isolated and fought off by certain immune cells." This didn't sound like news to me. Genome scientists have sequenced the DNA of cancer cells in exquisite detail in recent years, and we already know that cancer cells share common mutations. The paper itself, which appeared in Science on March 3, revealed a far less dramatic story. First of all, the new research applies only to lung cancer. It's a highly technical result that showed that certain immune cells in the body could–just maybe–fight off a particular type of lung cancer. There's no new treatment here, and there won't be for many years, if ever. The science here is pretty good, so I'm giving it an A-, but the reporting over-hyped its impact. Because they included the cautionary "could spawn new treatments", I'll give CNN a C.
"New Alzheimer’s treatment fully restores memory function"
If this is true, we're talking Nobel Prize material. Alzheimer's is a devastating condition that affects a large percentage of elderly people, and there's no known treatment. But when I looked up the paper itself, from March 2015, I discovered that it's a study in mice, not humans. The scientists here used a mouse that's been genetically modified to have brain defects that resemble some signs of Alzheimer's. They showed that they could use ultrasound–actually this part is pretty cool and quite exciting–to reduce some of the brain defects in the mice. Will this lead to any human treatments? Maybe, but there are numerous problems and caveats, as neuroscientist Matthew Zabel pointed out soon after the study appeared. And the effect, even in mice, was rather small: it's wildly inaccurate to claim that it "fully restores memory function." I give the science an A, but sciencealert.com gets an F for that headline. In all of these cases, the scientists involved are at least a little bit (if not a lot) complicit in the over-exuberant headlines. I understand their eagerness to call attention to their work, but by promising too much, they risk disappointing the public when no cures emerge one, two, five, or even ten years later. Journalists and scientists need to work harder to come up with headlines that excite people about the potential of science without making it seem that we've already cured humankind's most devastating diseases.